Here is an interesting piece about how Seville's pioneering head of urban planning, José Garcia Cebrián, pushed through a scheme to transform the streets of Seville with 80km (now increased to 120km) of segregated bike lanes. In doing so, he has increased the average number of bikes used daily in the city from just over 6,000 to more than 70,000. And increased the number of trips made by bike from 0.5% to 6%. What a stunning achievement! This is a terrific result for the innovative planners involved and a potential model for many Spanish cities, where the current public health disaster caused by inactivity needs some radical action. However, the article highlights how the rest of Spain could be slow to catch on to the idea...apparently more officials from the rest of Europe have visited to look at the scheme than other Spanish ones! But the key official behind the scheme in Seville is now working for the regional Andalucian government on a "Grand Andalucian Bicicyle Plan", so let's see if things can be extended. Whilst loving what has been achieved, my favourite paragraph of the whole piece talks of how the ambitious scheme got through the tortuous process of Spanish local government bureaucracy because ...."so few people believed it would happen at all. 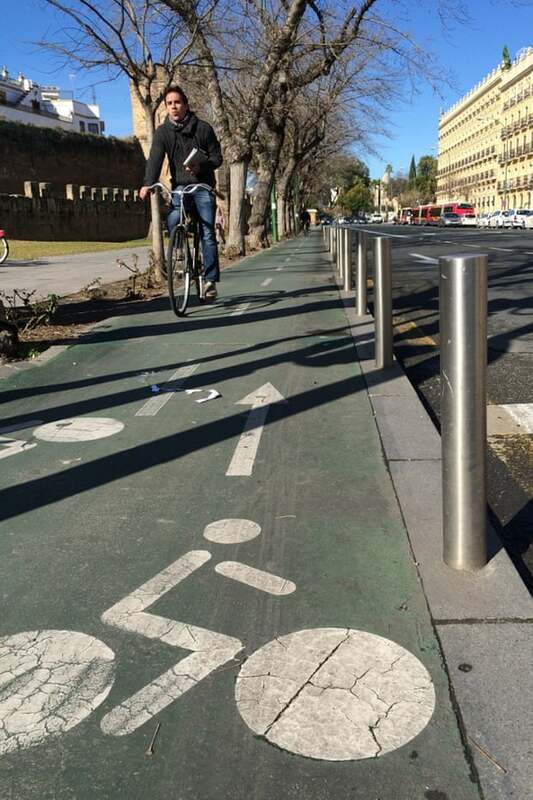 In Spain, there's a lot of planning about cycling, but then the plans get put into a drawer. So there was no opposition during the planning process, as everyone thought the same thing would happen. The opposition only started when the infrastructure was being built, and by then there was no way back. In fact, so surprised were some of Cebrián's Seville council colleagues when the work did start that on the first day officials from the transport department, separate from his urban planning section, tried in vain to get the construction crews to halt. They didn't, and the demand for the network soon became clear..." Don't you just love it when the right hand knows what the left hand is doing. Or maybe it's more a case of the right hand not believing what the left hand can actually do!